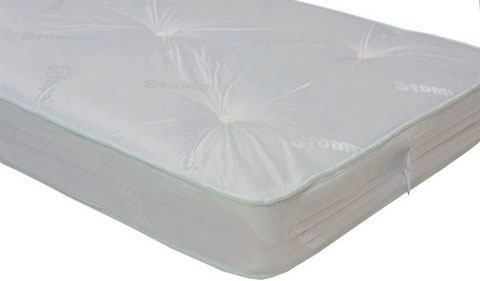 The Stompa pocket sprung single mattress has a full sprung unit consisting of 675 individual pocket springs in a fully caged wire frame for extra support. Layered to the top and bottom of the spring unit is a 1300g satin pad followed by a layer of 1100g duo pad and a 600g natural ultra sprung fibre pad for extra comfort. The mattress is covered in a smooth fabric with the stompa logo and is made from a polyester and poly-prop mix. All Stompa mattresses are made by skilled craftsmen in Yorkshire England. Special Offer - When purchased with many of our Stompa beds The Stompa pocket sprung mattress is available as a "When Bought With" deal. To claim this offer please select the mattress from the "Mattress Offers" drop down menu on any of our bed product pages that the option is available on.